Avg ?? Dst ?? Tm ?? Max ?? It looked like it was raining in the Canyon when we left but we decided to go anyway. The trail wasn't bad on the way up and the places water puddles were all dry. Before we could get to the gate though there was a mixture of rain and hail coming down. We would have continued but the lightning strikes were getting very close. So we turned around before the gate. 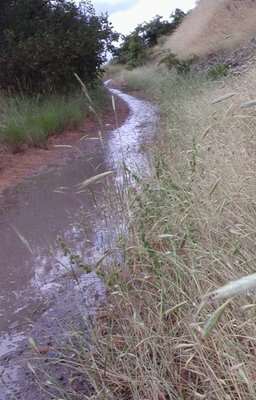 The trails that had been fairly dry were now rivers and puddles. It was a good thing we quit when we did because just as we got back in the building at work it started dumping buckets of rain and hail. Thought: Does Accidental Death and Dismemberment insurance cover stupid things like biking in a thunderstorm?